I admit this is a rather strange title for a post, but bear with me. Every once in a while I reflect back on the so-called "taper tantrum" event in the summer of 2013 when Fed Chair Ben Bernanke made an off-the-cuff remark that the FOMC was thinking of maybe slowing down the pace QE3 asset purchases (see here). The stock market had a temporary sell-off, which turned out to be no big deal. What I find more interesting is how long bond yields rose sharply and persistently. Even more interesting, real bond yields behaved in this manner--see the figure below. OK, so maybe the initial sell-off of bonds could be interpreted as the market being surprised that QE3 (an open-ended program) might terminate earlier than expected. But I just can't believe that QE programs can have such persistent effects on real interest rates. If that's the case, then what explains the broad pattern on display above, including the decline in real yields over 2011-2013? I attribute it largely to the recession of 2012-2013. Wait, what recession, you say? Well, let's take a look. Contrary to standard practice, I'm going to look at per capita consumption (of nondurables and services). Here is what the data looks like. Consumption growth per capita was negative from 2012.1-2013.3. The taper tantrum occurred in 2013.3. As you can see by this measure, the economy weakened considerably over the period 2011-2013. Over the same time, real bond yields declined. This is most easily explained as the consequence of an increasingly bearish outlook manifesting itself as an increase in the demand for safety (bonds). Consumption growth turned positive in 2013.4, and continued to climb well into 2015. So while the tantrum may have contributed to the spike up in yields, the reason they stayed higher is because of an increasingly bullish outlook for the economy. Does this interpretation make sense? What events were leading to the bearish outlook beginning in 2011. Certainly the events in Europe had something to do with it. I also think that domestic factors had a role to play, in particular, fiscal policy. Consider the following diagram. 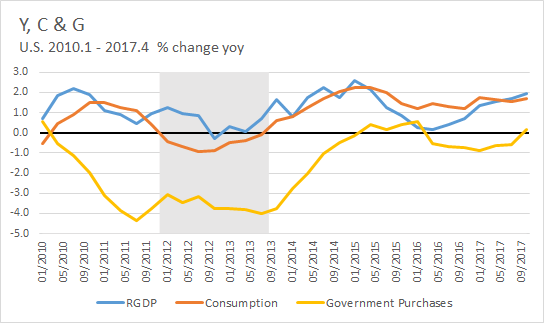 What would the consumption and GDP dynamic have looked like if government purchases (per capita) had instead remain constant? One way to decompose the GDP is in terms of its expenditure components, Y ≡ C + I + G + NX. I like to write "≡" instead of "=" to remind myself that this decomposition is measurement, not theory. 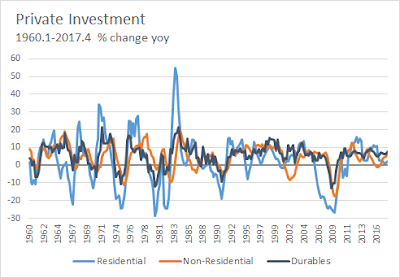 In what follows, consumption is measured in terms of nondurables and services only--I add consumer durables with private investment. 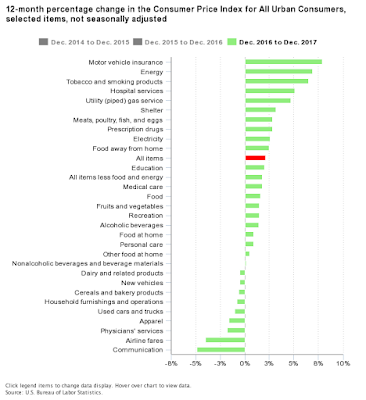 The data is inflation-adjusted, quarterly, and I report year-over-year percent changes. I'll start with recent history (since 2010) and then later look at a longer sample (beginning in 1960). Let me begin with GDP and consumption. I like to study consumption dynamics because I have some notion of Milton Friedman's "permanent income hypothesis" in the back of my mind. The idea is that individuals base their expenditures on nondurable goods and services more on their wealth (a stock) rather on income (a flow)--at least, to the extent they can draw on savings and/or access credit markets. To a first approximation then, one could interpret consumption as the trend for GDP. According to the theory, consumption should respond less strongly to perceived transitory changes in income (GDP) and more strongly to perceive permanent changes in income (GDP). In any case, here's what the data looks like for the U.S. since 2010. 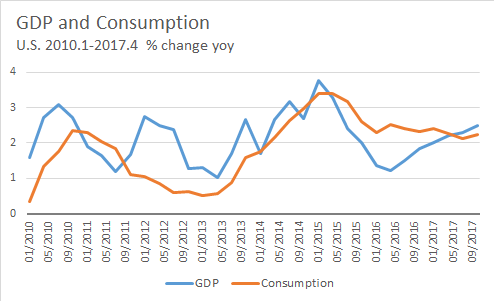 GDP growth since the end of the Great Recession has averaged about 2%, consumption growth somewhat less. Two things stand out for me. The first is the anemic consumption growth from 2011-early 2014 and in particular 2012-2013. Why were American households so bearish? (Note that the unemployment rate is declining throughout this sample period.) Things seemed to turn around in 2014, but then tailed off somewhat in 2015. Coincidentally (or not), that was the year in which the Fed talked out loud about "lift off" -- raising its policy rate for the first time from 25bp where it had remained since 2009. The second is where we're at now. Yes, GDP growth has rebounded somewhat since early 2016, but we're still well within the bounds of recent history (so, no sign of some impending boom). 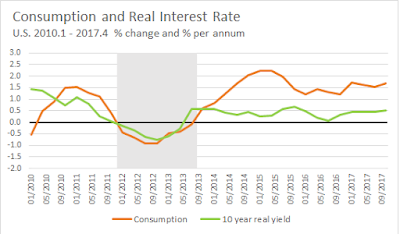 The tale is told by consumption growth, which has remained steady at about 2%. The following diagram plots private investment spending, decomposed into residential, non-residential, and consumer durables spending (note that the scales vary across figures). Well, here's a picture for you. 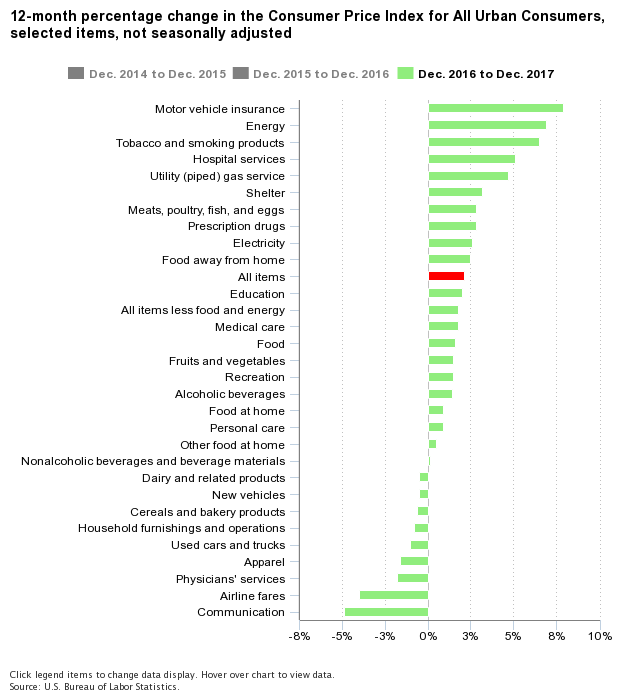 Government purchases of goods and services actually declined for most of this sample period. (Government investment consists mainly of structures and computer hardware/software (see here) and accounts for about 20% of government purchases.) I've been reflecting a lot on this picture lately because it looks different from what many may think, and also, it looks different from historical behavior (as we'll see below). For completeness, I include export and import growth. Nothing too interesting here. What does this same data look like from a longer time perspective? I reproduce the four figures above starting in 1960. This is really a striking figure, in my view. There are so many things that catch my eye. The first and most obvious is the decline in volatility beginning around 1985 (this is the so-called Great Moderation). Less obvious, but something worth noting is an apparent growing asymmetry associated with the Great Moderation. In particular, growth recessions seem roughly as severe as they've always been. What's missing are the sharp growth booms. 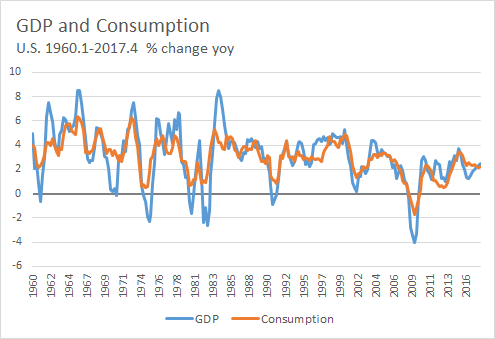 Third, it seems to me that consumption growth was much less volatile than GDP growth prior to 1985. Andrew Spewak and I discuss this here. One possible explanation is that business cycle downturns are generally expected to be much more persistent than in the past (why this might be so would be an interesting question to investigate). Finally, and perhaps most important, economic growth since 2000 has slowed down significantly. St. Louis Fed President Jim Bullard argues we are in a low-growth regime (see here). Is this a recurring phenomenon, as suggested by Schumpeter (see here)? 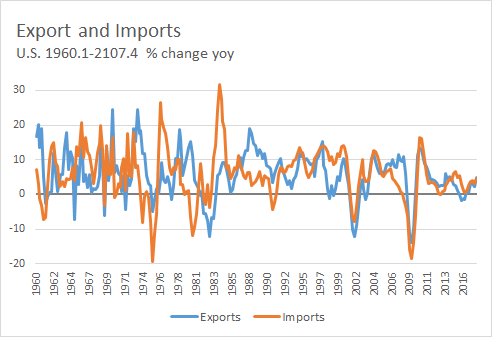 How much of the slowdown is explained by a post WW2 transition dynamic? Again, the Great Moderation is evident, apart from the monumental collapse of residential investment spending in the Great Recession. 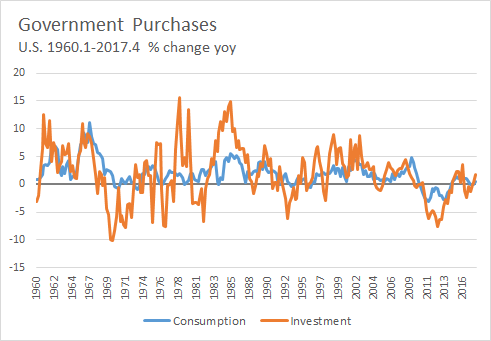 Like private investment, government investment is relatively volatile (though one wonders why this should be the case for government). The most striking aspect of this diagram is the collapse government spending in the immediate aftermath of the Great Recession. One can't help but wonder about the wisdom of such policy during such a period of economic weakness. For those in favor of reducing (G/Y), a more gradual policy would almost surely have been better (e.g., by letting Y grow into G, not by cutting G). 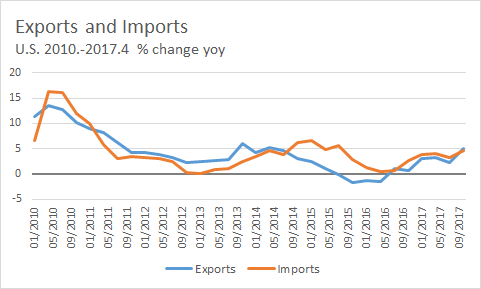 Finally, for completeness, here is export and import growth. It's interesting that the Great Moderation shows up along this dimension as well. If you have an economic theory that explains all these patterns, I'd be very interested to hear about it below. This post is me thinking out loud about how fiscal considerations may influence the price-level. The question of what determines the price-level is an old one. It's a question that economists struggle with to this day. Perhaps the oldest theory of the price-level is the so-called Quantity Theory of Money (QTM). It seems clear enough that people and agencies are willing to accept and hold money because money facilitates transactions--it provides liquidity services. In the simplest version of the QTM, the demand for real money balances takes the form L(y), where L is increasing in y. 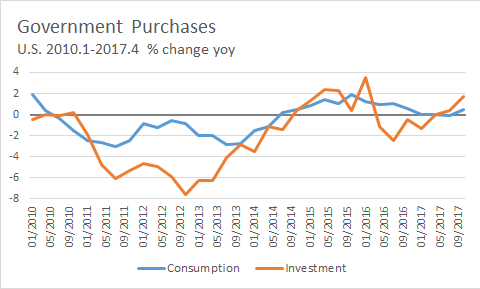 The idea here is that the demand for liquidity is increasing in the level of aggregate economic activity (as indexed by y). Condition  can be explained as the consequence of the "hot potato" effect. The idea is that someone must be willing to hold the extant money supply. If M/P > L, then the money supply exceeds money demand. In this case, people will presumably try to dispose of their money holdings (by spending them on goods and services). People accepting money for payment will be thinking the same thing--they are willing to accept the money, but only selling their goods at a higher price. The "hot potato" effect ceases only when condition  holds. The same logic applies in reverse when M/P < L (with everyone wanting to get their hands on the potato). Now, suppose that y varies over time. Then the QTM suggests that a central bank can keep the price-level stable at P0 by letting the money supply move in proportion to money demand; i.e., M = L(y)*P0. This is what is meant by "furbishing an elastic currency." This reminds us as well that interpreting money-price correlations in the data are tricky if money demand is "unstable." O.K., so now let's see where fiscal policy fits in here. Let D denote the outstanding stock of government debt. If a central bank is restricted to create money only out of government debt, then we can write M = θD, where 0 < θ < 1 is the fraction of the debt monetized by the central bank. If the central bank wants to increase the money supply, it would conduct an "open market operation" in which it buys bonds for newly-issued money, resulting in an increase in θ. Note that the money supply may increase through changes in D for a constant θ. Let B denote the bonds held by the private sector (i.e., not including the bonds held by the central bank). That is, B = (1 - θ)D. The interest expense of the public debt is given by rB. Note, while the treasury actually pays an interest expense rD, the interest payments to the central bank rM are remitted to the treasury, leaving a net cost equal to rB = r(D-M). Thus, the central bank is in a position to lower the interest expense of the public debt by monetizing a larger fraction of it (I discuss this in more detail here and here.) To the extent that the central bank influences r, it is also in a position to lower the interest expense by lowering r.
In most monetary models, the fiscal policy plays no role in determining the price-level. The reason for this lies in the implicit assumption that taxes are non-distortionary (e.g., lump-sum) and that the fiscal authority passively adjusts T to ensure that condition  holds. This latter assumption is sometimes labeled a Ricardian fiscal regime. In a Ricardian regime, fiscal policy does not matter for the price-level. To see this, suppose that the central bank increases r. Then the fiscal authority increases T (or decreases G) with no change in the money supply or price-level. Or, imagine that the fiscal authority increases D. In this case, the central bank can keep the money supply constant by lowering θ, the fraction of debt it chooses to monetize. If so, then B will increase. In a Ricardian regime, the fiscal authority will again either increase T (or decrease G), leaving the price-level unchanged. The right-hand-side of  represents the present value of a perpetual flow of primary government budget surpluses τ. The left-hand-side of  measures the real value of the government's debt. The equation  asserts that the real value of government debt is equal to the present value of the stream of primary surpluses. This is analogous to the way one might value the equity of a company that generates a stream of profits τ. Note that condition  looks a lot like condition . We can use the same "hot potato" analogy to describe the determination of the price-level in this case. For example, suppose that (B/P) > τ/r. Then people and agencies will presumably want to sell the over-valued government debt (for goods and services). People are willing to accept these nominal claims, but only if they are sold more cheaply--that is, if the goods sold to acquire the bonds can be sold at a higher price. As before, this hot potato effect ceases only when condition  holds. I'm still not sure what to think about the FTPL. While I lean more toward the QTM view, I do believe that fiscal considerations can have an important influence on the price-level. The way I'm inclined to think about this, however, is as follows. In a world where government debt becomes increasingly more relevant as an exchange medium than central bank money, control over the money supply is effectively transferred to the fiscal authority. This is another sense, distinct from the FTPL, in which fiscal policy might influence the price-level. The difference boils down to the source of money demand -- is it primarily liquidity-preference, or is it because money/debt instruments are viewed as tax-backed liabilities? There is, of course, much that I've left out here. 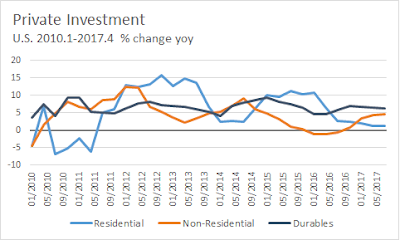 While the assumed invariance of real economic activity to monetary and fiscal policy is not a bad place to start for the question at hand, it is clearly not a good place to end. As well, the model should be extended to permit sustained inflation. All of this can be easily done and I'll try to come back to it later. Something I do not think is critical for the issue at hand is modeling private money creation (beyond the monetization of government debt modeled above). To the extent that banks monetize positive NPV projects, the money they create out of private assets (in the act of lending) creates value that is commensurate with additional liabilities created. In short, accretive share issuances (good bank loans) are not likely to be dilutive (inflationary). Of course, the same is true of newly-issued government money if the new money is used to finance positive NPV projects (including the employment of labor in cases of severe underemployment).